Star Wars: Lightsaber Escape – A Dream Come True! Today I was browsing through the news and came across a story that made my day. Thanks to Google I could finally battle stormtroopers with my lightsaber! 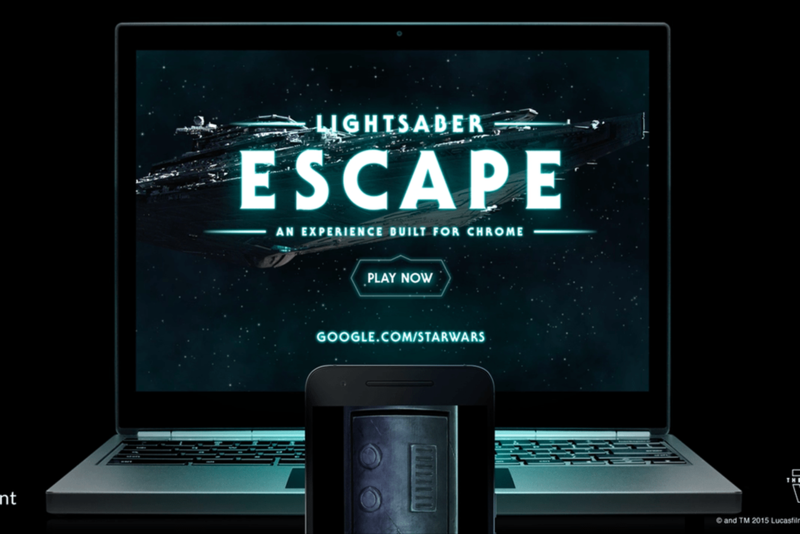 Lightsaber Escape is Google’s latest Chrome Experiment and like almost all other media right now, it ties in to Star Wars and the upcoming release of Episode 7: The Force Awakens. In Lightsaber Escape you are a Jedi and are trying to fight your way through hordes of stormtroopers. To do so you must first go to lightsaber.withgoogle.com/ on your computer. Once there you are given a unique URL to go to on your smartphone. After going to the site on your phone you are then instructed on how to calibrate and use your “lightsaber”. It starts you off slow with one stormtrooper being your first opponent. After that you are thrown right in. As you are a light side Jedi (you can tell by the blue lightsaber) you are not allowed to go on the offensive and can only deflect the blaster bolts the stormtroopers shoot at you. If you are lucky your deflection will direct the bolt back towards the stormtroopers. In classic stormtrooper fashion they almost always miss you and then they die in one hit. You have no control over your movement and from what I can tell you move forward after a certain amount of time in one location and as you progress it goes faster and faster while at the same time throwing more and more enemies your way. oI took a few minutes to play it and give it a quick try and found that the calibration was a little bit off the first time I set it up. Rather than the lightsaber being held directly in front of me like you see in the movies, my Jedi was going for a little crazier stance with the saber protuding from the general vicinity of the middle of my face. Once I got it calibrated it was quite straightforward and enjoyable. My wife, who hates Star Wars, was actually intrigued by it and even thought it was kind of cool. She didn’t actually try it out but she did watch me for a few minutes and she never gave me the look of disgust I attribute to her loathing of Star Wars. Ironically it was my son who thought of the only thing Google could have done to make this better. Find a way to do it with Google Cardboard! That would be pure nirvana! Although not quite the real lightsaber that I’ve been dreaming of since the first time I saw Star Wars it was a fun escape into the land of make believe that George Lucas gifted me. Thank you Google for another dream come true! Check it out at the source link below! Google Cardboard – A Little Rough But Still Awesome!